A safety data sheet (SDS) is an important document that the US Occupational Safety and Health Administration (OSHA) requires employers to make available to employees for any potentially harmful substances that may be handled in the workplace. 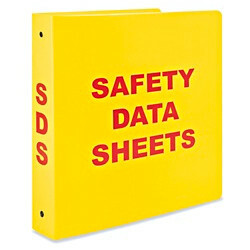 Your shop should have the SDS printed and readily available in an SDS binder (usually a large, bright yellow or bright white binder, ask your shop manager where it is if you are unsure), for any materials that you might be using in class. If you bring outside materials into the shop, you should first obtain and read the SDS for those materials, then print a copy and deliver it to your shop manager for inclusion in the aforementioned binder. These sections contain the information you need to be informed of the risks, and to make sure you do not suffer an injury while using the product. If you are considering laser cutting a material, section 5: Firefighting measures will contain important information about the thermal decomposition of the product, and any risks associated with boiling/burning/melting etc. Section 13: Disposal considerations can be helpful, but often contains generic statements such as "ensure disposal is carried out in accordance with applicable local regulations", which is not helpful to an end-user. Talk to your local shop manager about how you should dispose of a given material in your shop. Section 6: Accidental release measures is also important, but in the event of any accidental release (spill, etc.) you should contact your local shop manager to make sure the hazard is dealt with safely, according to local policies and regulations, rather than relying on the information in the SDS to address the release yourself. The remaining sections are often too technical for a non-specialist, or not relevant for the end user. It is easy to become overwhelmed by the organization of information, and specialized technical language, but a careful reading of the critical sections will be valuable. The section on hazard identification can be the most confusing, but it is also the most important to understand. The top of the section is often a sub-section titled GHS classification, with a list of hazard types followed by a number. The hazards listed in this section will be only those specific to this particular material, but are drawn from a longer list of potential hazards, which are sometimes divided by health hazards, physical hazards, and hazards not otherwise classified. In general terms, in the GHS system, a lower number means a higher risk, while a higher number means a decreasing, but still present risk. If you are interested in more in depth information (and you should be), it's possible to refer to guides like this, or this. To further break down our example, we can open the first OSHA guide and see that Acute toxicity (oral), category 4 means ingestion of between 300 and 2000 mg/kg bodyweight is expected to be lethal for 50% of those exposed. If this product was category 1 for acute oral toxicity, the lethal dose would be less than 5 mg/kg bodyweight. Skin corrosion, category 1 means that testers observed destruction of skin tissue, namely, visible necrosis through the epidermis and into the dermis, in at least one tested animal after exposure ≤ 4 hours and more specifically, sub-category 1A tells us corrosive responses in at least one animal following exposure ≤ 3 minutes during an observation period ≤ 1 hour. Luckily, if you can call it that, these injuries are considered local, although longer term manifestions of exposure to corrosives can result in scar formation. Perhaps more concerning should be Skin sensitization, category 1. A sensitizer causes little or no reaction in humans or test animals on first exposure. The problem arises on subsequent exposures when a marked immunological response occurs. The response is not necessarily limited to the contact site as it may be a generalized body condition. Since this is an allergic (immune) response, the level of exposure to trigger a response, and the strength of the response, will vary signficantly from person to person. Since there is no way to predict how it might effect you, the only safe course of action is to treat it very seriously and avoid exposure altogether. The guides linked above list all the hazard classification categories that might appear on any given SDS, with detailed descrptions of what each means. Extra credit is to read each listed classification and break down the meaning, as above. These are intended to distill the hazards and risks associated with the material to their most basic form. In this case, the exclamation point indicates any or all of the following: irritant, dermal sensitizer, acute toxicity, narcotic effects, or respiratory tract irritation. The second pictogram indicates a corrosive material. A complete listing of possible pictograms can be found starting on page 38 of this publication. There are two signal words, optionally added to materal labels and SDS: Danger and Warning. Danger represents more severe hazards, with warning for less sever hazards. Not all materials will include a signal word. Hazard statements are standard, assigned phrases determined by the hazard classifications. These phrases are redundant with the GHS classification information found in the SDS, but should be included on compliant product labels also, whereas the more detailed GHS classification information may only appear in the SDS. Neither of the guides includes a comprehensive list of all hazard and precautionary statements, as they are meant to be self-explanatory and more in-depth information on the specific hazards can be obtained from the SDS. However, there are several websites online listing all the hazard statements in one place, for anyone interested in reading through them. Precautionary statements serve almost as notes for other information found in the rest of the SDS, such as first-aid measures, PPE requirements, disposal, etc. If they are thoroughly written, then can be helpful as a condensed resource, but should not be used as a subsitute for reading those other critical sections in their entirety. The sections on first aid, handling, storage, exposure controls and protective equipment, and disposal are all written in plain languge, and so should not require an explanation here. Many of the materials you will encounter in the shop could be hazardous to your health, some extremely so. The materials often will not have overt warning signs, or properties such as strong odors, to intuitively warn you of the dangers, so it is important to be comfortable reading SDS, and proactive about doing so before using a material you are unfamiliar with, or even as a refresher when you use a material you have not used for a while. Be aware that manufacturers may change the formulation of their products, but still market them under the same brand names, so it can be important to review a current SDS for this reason. Finally, unfortunately, SDS are created for regulatory compliance, and may not have your best interest or safety in mind. Risks can still be hidden in relatively unfamiliar language, and sometimes it's really not clear what safety procedures are required. A common phrase is "use in a well-ventilated space" which can mean many things to many people. Remember that you can always ask your shop manager or the environtmental health and safety officer who supports your shop if you have any questions or concerns. If you feel you have been exposed to any chemicals, report this to your shop manager and visit your campus medical clinic, or a local hospital, if the exposure is serious.